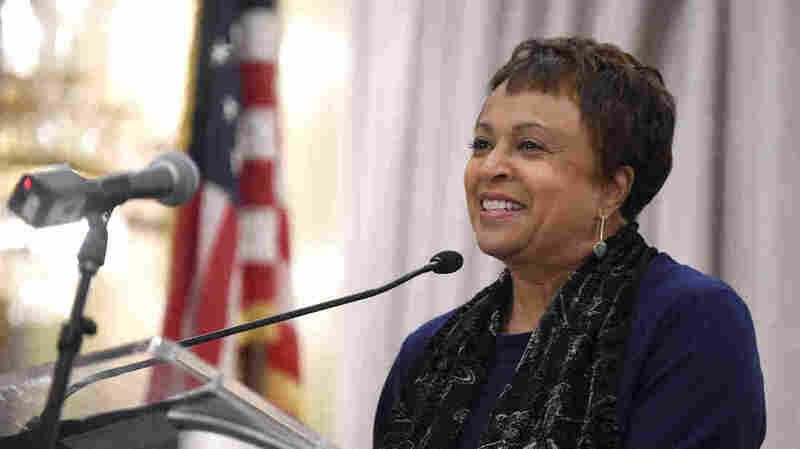 Senate Approves Carla Hayden As New Librarian Of Congress : The Two-Way Hayden is the first woman and first African-American to hold the position. She's the head of Baltimore's library system and the former president of the American Library Association. Carla Hayden, shown in 2015, was confirmed by the Senate on Wednesday to head the Library of Congress. Hayden is the longtime leader of Baltimore's library system. John Billington, the previous librarian of Congress, was appointed by President Ronald Reagan and served for 28 years before retiring in a cloud of criticism in 2015. The position used to be a lifetime appointment, but after Billington retired, Obama signed a law establishing a 10-year term for librarians of Congress, The Associated Press reports. The Library of Congress, under Billington's leadership, was criticized for failing to keep up with changes in technology. The Government Accountability Office highlighted problems with the library's information technology systems, in particular. In a White House statement from February, when Hayden was nominated, President Obama highlighted her long experience in the world of public libraries. "Dr. Hayden has devoted her career to modernizing libraries so that everyone can participate in today's digital culture," Obama wrote. "She has the proven experience, dedication, and deep knowledge of our nation's libraries to serve our country well and that's why I look forward to working with her in the months ahead." "The Library of Congress is the largest library in the world, with 162 million items in its collections," NPR's Elizabeth Blair notes. "It also oversees the U.S. Copyright Office."